Many dynamic glass systems require mechanical support, such as electricity and computer software, to transition between states of high and low transmission. These necessary conditions and devices add to the initial and on-going maintenance costs. By using Self-Tinting Glass by Smartglass we eliminate these worries by drawing all of its operational energy directly from the sun’s energy. Smartglass has a special thermo chromic PVB Interlayer (tri-layer) that when laminated between glass layers and introduced into an insulated glass unit, has self-tinting properties. This combination allows the glass to be self- sustaining by gradually darkening in response to rising temperatures from exposing the glass to direct sunlight. As the sun moves across the sky, in time, it automatically returns to its clear, natural state. The Self- Tinting product by Smartglass automatically darkens to balance the sun’s heat entering a building – throughout the entire day. There are many benefits of using Self-Tinting Smartglass. From energy saving aspects to occupants comfort. This innovative product helps to increase safety within buildings as well. Smartglass can lower costs associated with air conditioning, artificial lightening and heating/air- conditioning. The greatest energy savings appear during peak energy consumption periods when energy costs are highest. This saves money and is environmentally friendly. Total costs could be decreased up to 70 % ! Self-Tinting Smartglass interlayer can help to manage a building’s changing needs for passive solar gain, solar control and natural daylight transmittance. 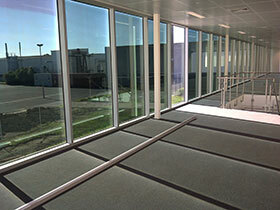 It increases occupants comfort by keeping a consistent heat level within the building and does not limit outdoor views. This means we can minimise the need for blinds and shades. Smartglass Self-Tinting Glass will gradually darken down for you. This will balance the intensity of incoming light and substantially decrease the heat coming in through your windows. 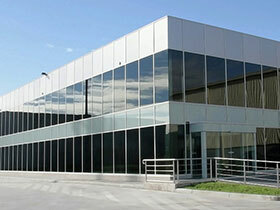 Smartglass Self-Tinting is a laminated glass that enhances building security. It is an excellent insulation material that reduces outside noise. It also blocks UV light and reduces the absorbed heat and light both of which are significant causes of furniture and carpet fading. It is powered by heat from direct sunlight, so there is no manual, mechanical or electrical intervention. It is a durable and maintenance-free, moreover it was listed in the top 10% of green building products by Green Spec Listed society in the USA.